Butter can bring mouth-watering flavor to many recipes. But have you ever tried goat butter? 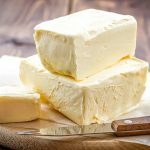 Did you know the various advantages goat butter has over cow butter? There are a number of ways goat butter can benefit you. Would you like to know more? Please keep reading! Goat butter is, you guessed it right, prepared from goat’s milk. But, what you did not know is that the milk from a goat has very less cream on the top. This is much lesser than what we see in cow’s milk, and hence the butter-making process becomes a little tougher. A goat also gives only a few quarts of milk a day, compared to a cow’s gallons. So, isn’t the butter precious? Cow milk is, without doubt, very healthy. Still, cow milk protein is known to cause certain allergic reactions in some people. Goat’s milk is better tolerated, as it contains lesser amounts of these allergenic proteins (1). Milk from a goat has few more advantages. In structure, it is the closest to human milk. It is easier to digest as it has smaller fat globules (2). 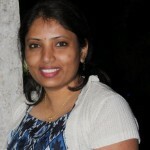 It also has shorter-chain fatty acids that are easily available for the body. Goat milk has lesser lactose content. It is naturally low in cholesterol. Goat milk has many essential minerals, vitamins and plenty of calcium. It enhances iron and calcium absorption in the body. Milk from goat is slightly alkaline, unlike the slightly acidic cow’s milk. Cow’s milk, though popular, is also the cause for bloating and irritation in the stomach (3). People who consumed goat’s milk did not face these problems. Goat butter has a lower melting point. This means that it can melt quicker than any other type of butter, allowing you to spread it faster on a savory dish. By virtue of its lesser lactose content, goat butter is more easily digested than cow butter. Lactose intolerant people can forget margarine and enjoy butter for a change. Unlike cow butter, goat butter is very light. The cream of this butter is not as heavy in the mouth as traditional butter because of its fat structure. Goat butter makes your recipes cheesy, but also injects a lighter freshness to them. First time tasters would say goat butter has a musky goat-like taste. However, the butter confers a sweet, tangy flavor to recipes. It is especially delectable with sea salt on the side. Just pair it with radishes, and you will find out what goat butter tastes like. The butter is white as snow since it does not have any of the added ingredients that render cow butter yellow. It is the same color as the milk, meaning it retains its original goodness. Goat butter even maintains the earthy aroma of milk. Goat butter has higher moisture content than cow butter. When cooked with green leafy vegetables, it coats the leaves well, makes them soft and taste great. Have 2 spoons of goat butter, and you get 75 calories. But these calories include fats that aid your digestive processes. As goat milk is naturally low in cholesterol, it would be a good idea to prefer this over the alternatives. Goat butter can be used very much like cow butter. It can be spread on a bread toast, mixed in cookie dough, swirled with vegetables in hot pans and had alongside a glass of wine. Goat butter accomplishes all this while imparting heavenly taste to the dishes. In recent times, cows are pumped with growth hormones intended to enhance milk production. Cow’s milk products are mass produced, which come with their own pros and cons. Goat’s butter, on the other hand, is untouched by mass production. It is less toxic, coming from an untreated goat. 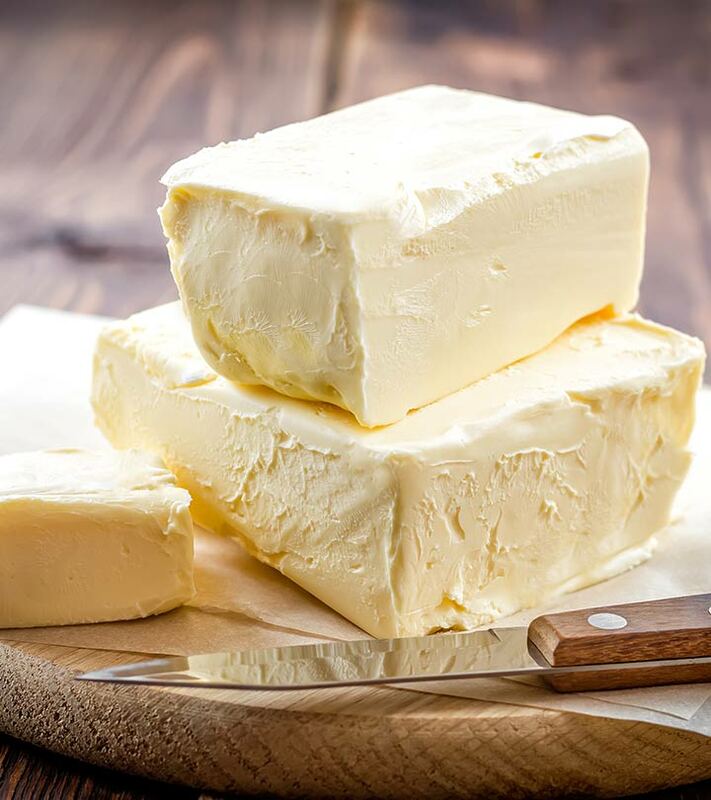 Goat butter has all the nutritional properties of cow butter, only at a better deal (4). Since goat butter does help our digestive system, it is an added bonus. So, go grab goat butter and enjoy its wondrous benefits. Hope you found the post helpful. Do you know how to make goat butter at home? Do share your recipes with us in the comment box below!